Decorative artist, Heather Bruno-Sears, combines her love of well-wrought work and life itself to create an endless repertoire of clever visual effects. Since 1999, she has worked diligently to create unique, one-of-a-kind finishes for hundreds of patrons. 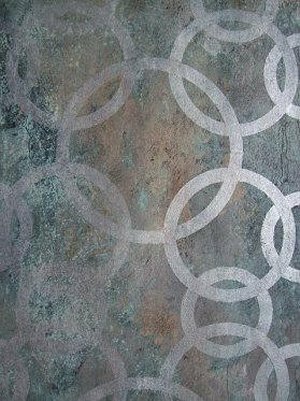 Her extensive portfolio consists of exquisite surface design applications suitable for walls, ceilings, floors, doors, glass, mirror, furniture, counter-tops, and canvas. Heather's work is found throughout the central New York Finger Lakes region. She loves to travel, and has also ventured for clients in New Jersey, New Hampshire, Vermont, Virginia, Florida, Long Island, and the Thousand Islands. A passion for hand-wrought craftsmanship, appreciation of foreign cultures, architecture and art history culminated in Heather having opportunities to travel with industry leaders for inspiring painting adventures in Marrakech, Morocco and Barcelona, Spain. Formerly, Heather worked directly with famed home-furnishing designers, Victoria and Richard MacKenzie-Childs, as their Quality Control Manager and Company Archivist. Special assignments included; assisting with the MacKenzie-Childs, Ltd. flagship store opening on the corner of Madison Ave and 69th in New York City, performance art for marketing purposes, and working in Taiwan on the original black/white check and marble series production samples for the Camp Enamelware collection. Currently, Heather is renovating a circa 1814 stone schoolhouse in Spafford, New York. "It was a little historical gem near ruins all overgrown with a dirt floor, four crumbling stone walls, and a huge hole in the roof!," she muses. "I have a keen interest in art, architecture, and antiquities. Not only did I want to salvage the schoolhouse for sentimental reasons, I saw the potential it had to be an English cottage style artisan retreat and studio." Open house celebration to be announced.